Our Community - Phalcon, Ltd. The McPhee Awards Banquet, an annual company event, was held at the Thayer Hotel at West point on March 16th to honor our many employees from Connecticut and New Jersey. The highlight of the evening was the presentation of the Teddy Awards. McPhee Electric has a longstanding tradition of recognizing exceptional men and women in our workforce. 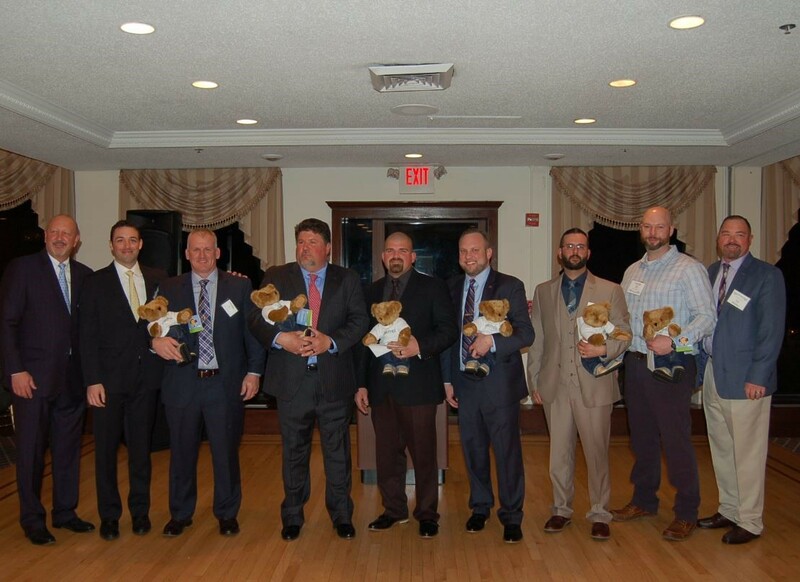 Named after our founder, Ted McPhee, the “Teddy Awards” have become a tradition and part of our culture in celebrating individuals who continually strive to make McPhee Electric an outstanding place to work. This year, we are excited to recognize six great people: John Lensi, Tony Recanati, John Tomczak, Nicholas Melchiorre, Ryan Warwick and Dave Hewitt. Congratulations all! McPhee appreciates your hard work and dedication. McPhee has announced leadership transitions today positioning McPhee to expand its utility and commercial business across its New England and Mid-Atlantic footprint. Julie Blum, McPhee’s long -standing Vice President of Estimating will her shift focus to Management Development and Training targeted at the next generation of leaders beginning January 1, 2019. 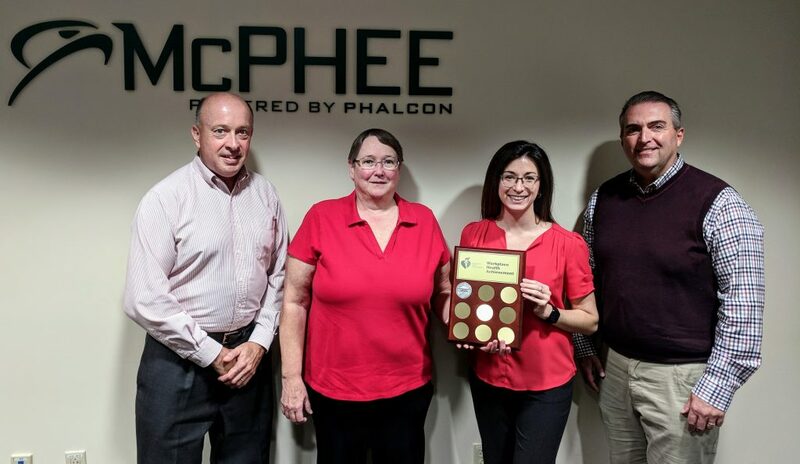 “Developing leadership talent energizes a company and these transitions establish a creative environment for our employees,” said Mike McPhee, CEO of Phalcon, Ltd.
“The team at McPhee has such a strong reputation and is so competitive, in large measure due to Julie’s impact over the years, that it was a good fit with her strengths and our larger needs. We are looking forward to her turning her attention to an area that will be critical to our success as we develop leaders for the future in order to keep our top position with customers in the markets we serve,” says Marcus McPhee, President of McPhee Electric, Ltd.
Old Saybrook — Workers with McPhee Electric Ltd. make structural improvements to the cellular antennae atop the 200-foot-tall electrical transmission tower on the Old Saybrook side of the Connecticut River. In a few weeks, the Park at Harlinsdale will be full of barbecue teams working to present their culinary expertise in the Great Americana BBQ Festival. This year, the teams will not need to rely solely on their generators for power as the Franklin Noon Rotary Club in partnership with the city of Franklin introduced a new power source that will be available for all the teams to tap into. 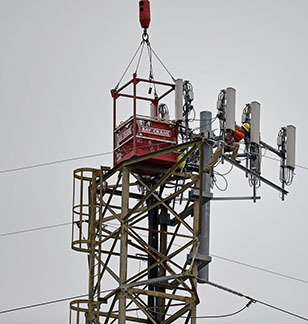 The 1200-amp power grid, located on the north side of Harlinsdale park, will be able to provide power for all of the competing teams. The Franklin Noon Rotary donated the money for the project from funds raised by the Great Americana BBQ Festival and the Franklin Rodeo through its foundation. The Dream Cruise and Wrangler Rally is one of the largest car cruises benefiting Special Olympics and The Hometown Foundation, Inc. Hundreds of automotive enthusiast from all over the country convene at The Farmington Polo Club. 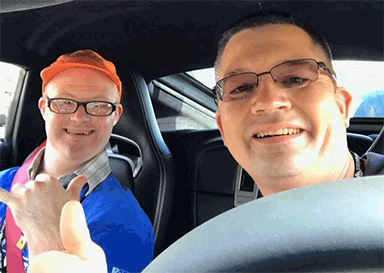 As part of the cruise, Special Olympics athletes are paired with the exotic, classic-car, or Wrangler owners and are given the opportunity to ride in their vehicles. The police-escorted cruise, journeys through the Farmington Valley for 12-miles and ends at The Farmington Club, where the athletes are honored at a red carpet affair. 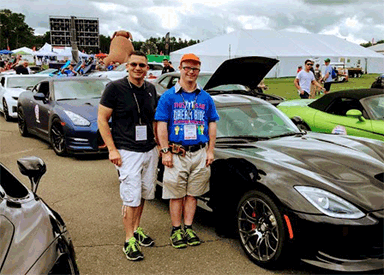 This year Bernie Knochenhauer from McPhee Electric, LTD was chosen to drive a Special Olympic Athlete in his 2013 Dodge Viper . Despite the clouds and some rain, everybody had a wonderful time. 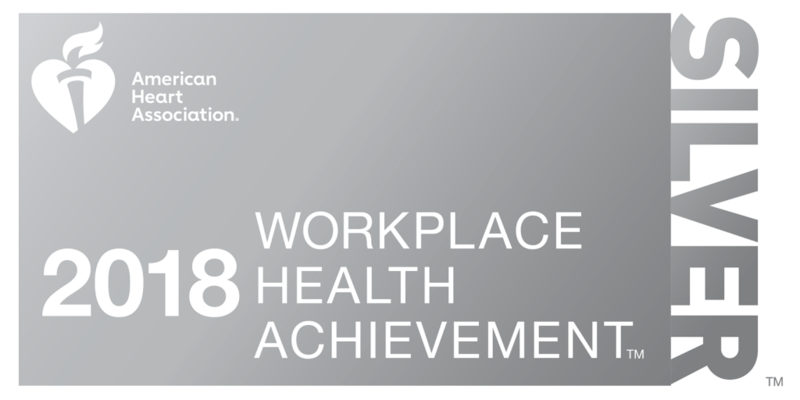 The results of the American Heart Association 2018 Workplace Health Achievement Index were announced yesterday and Phalcon and its regional operating companies achieved Silver level recognition for taking significant steps to build a culture of health in the workplace. Phalcon, Ltd. is a leader in utility construction, electrical contracting, industrial and energy infrastructure, and facilities services. Phalcon combines the cross platform expertise of our 1200 employees from operating companies to provide specialized combination engineering and installation expertise to our clients. Locally, Phalcon owns McPhee Electric, PowerHawke, and Ravex, each headquartered in Farmington. The Phalcon Wellness Program was developed in 2012 to improve employee health and wellbeing and has been awarded for being a progressive program, especially within the construction industry. 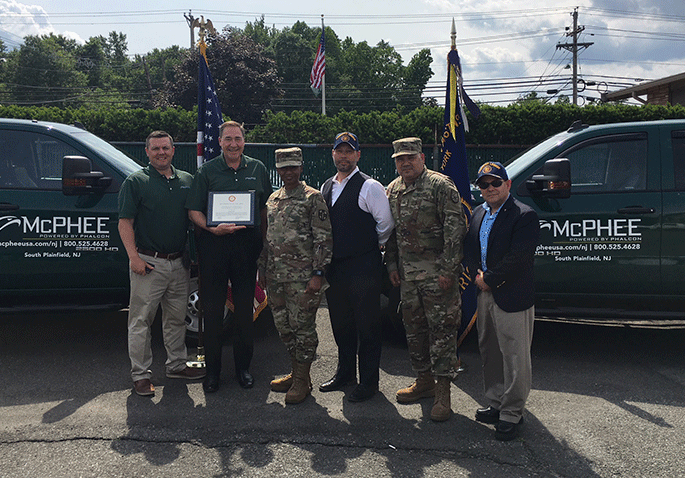 Friday, June 8th, McPhee South was presented with the Patriotic Award from the American Legion Post Coffey and Wilson 688 of Brooklyn NY. This award recognizes our continued contributions to Veterans and involvement in charitable events. With the change of names, we found that we had an abundance of JBL promotional items and we were not quite sure what to do with them. Sayyed Muhammad, our new Logistics Manager, suggested that we donate them to soldiers and their families overseas. So, with that and our other contributions to veterans and the community , we were presented with this prestigious award. 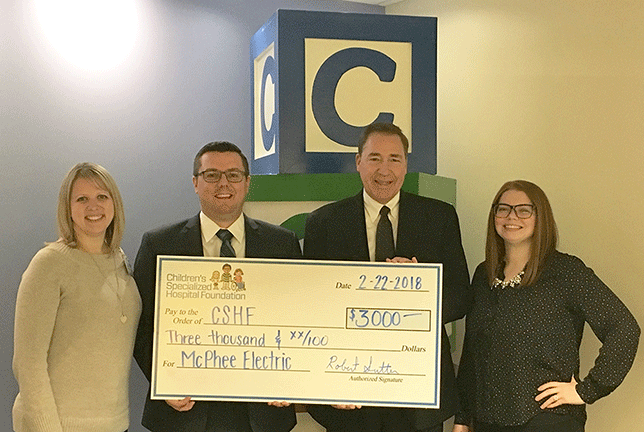 McPhee Souths Bob Sutter, Andrew Wallace, and Ayla Gruca recently visited the Children’s Specialized Hospital and presented them with a $3000 check raised from thier annual Holiday party this year. To get in the spirit of the holidays, the ladies of the Beltsville Richards office held a Secret Santa gift exchange! Everyone who participated wrote a short list to Santa with 3 gift ideas and names were then picked at random.The exchange not only a great way to get excited for the holidays, but also a great way to get to know some of our new(er) colleagues! 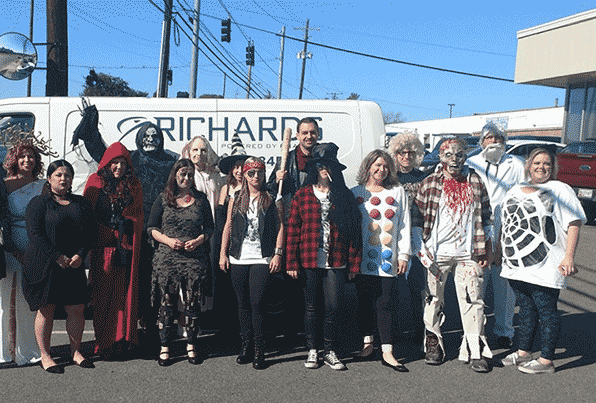 This year, Richards celebrated Halloween with its 6th annual Halloween party and costume contest! 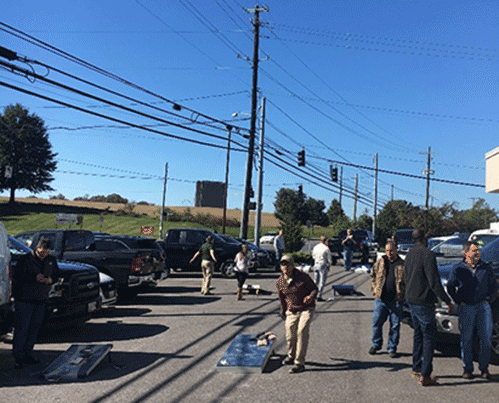 The lunch-time celebration transitioned into a parking-lot party with a Corn Hole Wellness Contest as the office paired off to play against each other. Brett also took first place in the Corn Hole competition with partner, Sr. Estimator, Danny Littleford.